A hanging file keeper is a type of file holder that is very easy to adjust and convenient to use. Hence, it is very popular with office workers. 1. The slide bar coated with OEL is easy to slide, thus making this file keeper easier to obtain documents. 2. 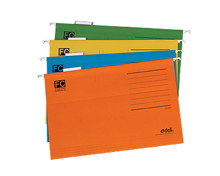 This hanging file keeper is provided with classification labels for users' convenience. 3. Imported paper is utilized for longer life. 4. This file keeper is widely used in modern offices and luxury hotels. As an experienced hanging file keeper manufacturer, we at Deli Stationery are dedicated to satisfying our customers by providing quality office supplies such as stapler, paper punch, binder clip, desktop set, clipboard, paper trimmer, pencil sharper, and more. Thanks to our consistent efforts over the past years, our products are reliable, cost-effective, and are well received by customers all over the world. Located in Ningbo, Zhejiang, we enjoy convenient air, land and sea transportation. This enables us to ship customers their orders quickly, and reduce their freight charges as well. We welcome you to contact us for more product information. Name Card Holder1. Soft cover makes users feel comfortable when touching our name card holder. 2. Metal angle bead is used to prevent wear and tear. 3. Name cards can be classified and easily found.